We would like to introduce our new head chef Ryan Kellow. 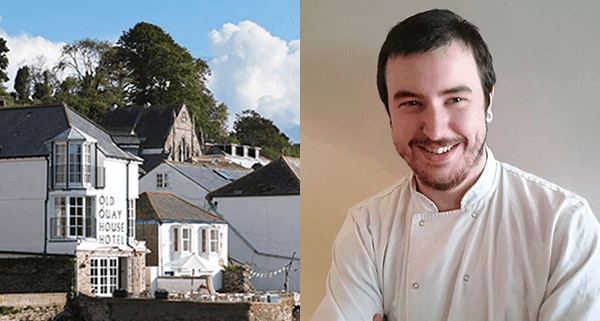 Ryan worked at the Old Quay House from 2012-2013 and after stints at the St Moritz Hotel and Hotel Endsleigh in Devon he rejoined the team as sous chef in February. He was recently promoted to head chef following Ben Bass’s departure. Ryan lives and grew up just a few miles away from Fowey in St Blazey so knows the area well. He is keen to build on his relationships with local suppliers such as Fish For Thought and Kittows of Fowey to ensure the best local and seasonal, fresh ingredients are on the menu. What is your style of cooking, and do you have a favourite ingredient? I would describe my style as classical French with a modern twist. Ingredients I love to work with include asparagus, gooseberries, and different types of game meats, in particular squab pigeon. My favourite dish is roast squab pigeon, fondant potato, beetroot, kale and hazelnuts. The most popular dish is Cornish fillet of beef, potato and beetroot rosti, spinach, wild mushrooms and foie gras. When I’m not in the kitchen, I like to go to the cinema – I love horror films. I will also head to Plymouth to go shopping with my girlfriend. Polkerris is my favourite beach, and not far from Fowey. The pier is a great spot to fish from, and you can eat at Sam’s on the Beach or grab a drink at the Rashleigh Inn. A little further afield…I also enjoy eating at Route 38 – an American-style diner near Saltash, and the St Moritz Hotel. I can also recommend Austell’s at Carlyon Bay.